Once upon a time, a friend of mine made a small fortune off selling Titanic-related shirts that said something like “It sank. Get Over It.” As evidenced by recent news coverage, television retrospectives and James Cameron’s re-release of “Titanic” in 3D, few people have gotten over the fact that the Titanic sank 100 years ago today. It’s a story that involves mind-boggling sums of money and human interest and tragedy (and so many other little kaleidoscopic shards). If you can disassociate the tale from the maddening Celine Dion tune that will be forever linked with it (and good luck with that, by the way), it is likely that you will find at least one of the many threads in this story fascinating. When I began graduate school two years ago, I had a first semester project that involved reading at least two British newspapers from a specific month and year and crafting a story from the reports and ads that I saw. My assignment was April 1912. It did not take long for me to see the goldmine that resided in that particular month and year. Shortly before Easter in 1912, Chancellor of the Exchequer David Lloyd George stood before the House of Commons, cheering the country’s strong trade figures (sugar and tea were the only disappointing sources of revenue) and record budget surplus of £6,545,000. Fiscally, the country had come a long way in three years. In 1909, Lloyd George inherited the largest peacetime budget deficit in British history and the nagging sense that there would be rapid expenditure growth in the future. His answer to that fiscal challenge was a budget that was “subversive, Socialistic, revolutionary,” something where everyone contributed their fair share toward funding the national agenda both domestically and abroad. However, with extra funds in hand and with no plans to introduce new taxes, Lloyd George told the House that he would be setting aside the 1912 surplus for contingencies, one of them being the Navy, which was eager to keep pace with a suspected naval buildup in Germany. In spite of that neighborly tension, Lloyd George concluded his address on an optimistic note, stating that the nation was more prosperous than ever. Lloyd George’s optimism might not have been shared by the average Briton, who, judging from newspaper reports of the period could have been reflecting more on the note of contingency bubbling beneath the surface of their finance minister’s address. For all the newspaper enticements to see the world on a luxury cruiser, educate one’s children at a tony boarding school, wear the latest spring styles (“in harmony with Paris fashion, but not extreme”) and reap the rewards of business opportunities abroad, there was the sense that for all its prosperity, Britain’s standing – not to mention its sense of self — was being threatened by forces beyond its control. The Empire, which was viewed alternately as a source of wonder and a source of income, was threatening to unravel, with British dominions tiring of Mother England’s control of their finances and futures.Industrial turmoil ravaged travel, trade and income. Women, for their part, wanted a say in national life, fighting for a vote that was eventually denied them. In protest, they smashed shop windows and conducted hunger strikes in jail. Government ministers pled for calm and reason in the midst of all this, as the mammoth luxury liner the Titanic set sail for New York with 1,375 passengers on board. The ship’s owners — White Star Line — said the vessel was unsinkable, but an iceberg in the middle of the night would prove them wrong. The average Briton might have wondered whether his big, bold prosperous country was destined for a similar fate. I won’t paste the rest of the paper in its entirety, but I will offer you bits and pieces, hoping to add to the titanic Titanic discussion that has been going on for the past week. So what did it mean to be British in 1912? According to some reports, it meant that you were hardworking and tight-fisted with personal finances. You were a family man (or woman), who went to church, gave back to your community, and quietly bumbled about in an endearingly helpless way. Maybe you wanted to better yourself with elocution lessons. Maybe you wanted to better the lives of other people by donating to, say, cancer research. The world around you was a curious place and upper crust society felt that the world around it had a lot to learn from England, instead of the other way around. There was, however, a large segment of middle class Britons who wanted to learn by seeing the world. And then there were the suffragettes. Women’s rights advocate Sylvia Pankhurst, in a letter to Guardian readers, asked Britons to consider the world’s view of how the country was treating its suffragettes. “What barbarians they will think us,” she wrote, for mistreating women “who are fighting to secure simple human justice.” British newspapers sought to bring context to the so-called barbarity, running stories about successful and not-so-successful attempts to establish women’s suffrage movements in other parts of the world. In Britain, suffragettes waged hunger strikes in prison and complained of dirty prison cells full of bugs and of being force fed against their own will. Some letters to the editor expressed delight at the thought of suffragettes being subjected to cockroach-infested living conditions. One letter to the editor of The Times went so far as to say that women should be abolished because their unreasonable, hypersensitive presence was a distraction. Lady Castlereagh, in another letter, countered that men could be just as crazy as women and that neither gender was complete without the other. Castlereagh wrote that women were in society, working and being many things to many people; there was no reason why they shouldn’t have the vote. Their pleas were debated in Parliament, with some ministers lamenting the barbarity to which Mrs. Pankhurst referred and the Home Secretary reminding ministers that there were shop owners with broken windows who might not think that women were being treated severely enough. Amid this political back and forth, a sanatorium opened in Manchester, but locals thought it would be bad for the community. Perhaps that sanatorium couldn’t have arrived at a better time. The Titanic was said to be unsinkable and yet there were reports prior to its departure of other large ships sinking off the European coast. Insurance companies were nervous about what would become of them if one more big boat sank. The Titanic was a big boat and it was creating a lot of excitement in a Britain that was unsure of itself. The mammoth liner, which weighed 46,000 tons, featured “elaborate cafes and reception rooms,” Turkish baths, a gymnasium, massage machines, squash courts and private apartments with private promenades decorated in the Elizabethan style. The passenger list included 325 first class passengers, 300 second class passengers, and 750 third class passengers. 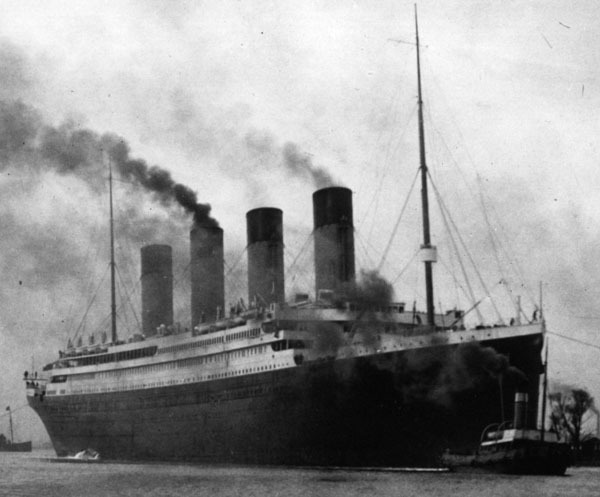 The weather was clear when the Titanic set sail on April 10, 1912 and the seas were reportedly calm. Five days later, however, a torrent of conflicting reports bombarded British newspaper readers. In The Guardian, on one page the liner was lost, on the next page the liner had had an accident, and on the page following that the newspaper said the ship had hit an iceberg in the middle of the night. In The Times, the newspaper acknowledged the “conflicting early reports,” but wrote that as the day wore on, there was the “bare possibility of the worst calamity in transatlantic annals.” A jumble of telegraphs and wire reports were juxtaposed in each newspaper on the first day of coverage, haphazardly in The Guardian, reflecting the confusion about what had transpired. As the tragedy unfolded, The Guardian railed against American amateur telegraph operators and falsified American news reports of the incident, while both papers put their own correspondents on the scene for survivor interviews. The Guardian, meanwhile, sought color in the local docks, turning to sailors for their yarns about what it was like to encounter rough weather and icebergs. Insurance underwriters were now faced with a catastrophe they were still trying to comprehend. Uncertainty prevailed as survivor numbers trickled in, families ran to White Star Lines offices to wait for word of their relatives. Survivors told tales of barely-clothed people who either went mad or froze to death in the night. Reflecting on the Titanic disaster, The Guardian wrote, “the tragedy is full of the idea that any exaggerated sense of great power is the inevitable prelude to disaster.” The newspaper might have had Britain in mind when it wrote those very words.